FINAL PRESENTATION : PLA DE REIXAC – Master in Landscape Architecture Barcelona – Universitat Politècnica de Catalunya – 35ª EDITION. 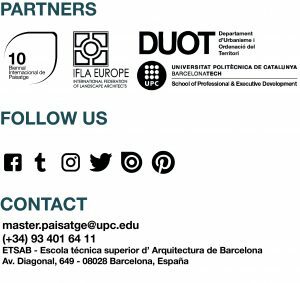 The professors of the workshop (Manuel Ruisánchez (Architect), Anna Bonet (Architect and Landscape Architect MAP’04) and Marcel Cumplido (Architect and Landscape Architect MAP’07) saw and commented the works of the student. Laura Cambrubí (environmental science expert) was also present to give her opinion. During the day the students explained their strong analysis of the structure of the territory, that permit to produce the design of a green infrastructure. The groups focused on different scales in the area of Pla de Reixac: it gave the possibility to discuss different strategies and opinion in between students and professors. However, the principal goal was to create a green connector next to the streams, trying to better the transversal connection through the Pla de Reixac. In the pictures, it is possible to see some examples of the works, that combine actions on the landscape connected with the green infrastructure. The day ended with a discussion in between all, professors, students, and guest, about the different opinions about landscapes and the different strategies about the territory.